David has been a teacher since the 70's. For the past 7 years he has taught an deployed the Appalachian Round Peak claw hammer style banjo. He is also a certified Wernick Method bluegrass jam teacher, as well as a professional artist and illustrator. He began his music career in 1961 when he first heard banjo music and fell headfirst as banjo players often do!. Growing up near New Haven, Connecticut he immersed himself in the rich folk and bluegrass scene centered there, and by 1963 was playing in various bluegrass bands and and performing with guitar in folk music venues in the area. 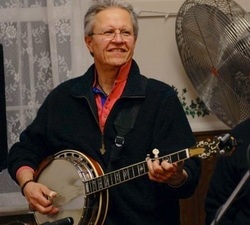 He was a founding member of the seminal Northeast bluegrass band Apple Country which played from the late 60s through the mid 80s around New England and the South. He has been an active musician in the Seacoast area of Portsmouth New Hampshire and Maine, where he helped form Lonesome Dave and the North Dixie Road Kings with Harvey Reid and Rick Watson and the band Hot Ticket with Cosy Sheridan, Susie Burke, his wife Linda Schrade and David Levine. He and Linda have played music with a number of groups including John Kirk and Trish Miller and Quickstep in the Saratoga Springs New York area they have lived with their daughter Allison since 1992.